Quality and stewardship are the two critical issues every church faces when selecting worship seating. Contemporary and traditional churches alike are searching for the best seating options. Seating is the most visible and interactive part of any sanctuary. With increasing frequency, churches are electing to purchase stackable chairs for their sanctuary and multipurpose spaces to have the ability to change their seating layout for special events, cleaning, storage, as well as having versatility for future needs. 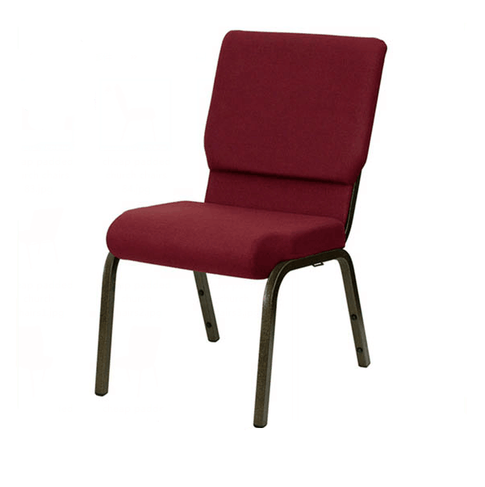 Stackable church chairs represent the most affordable seating option in the seating industry. Both metal and wood church chairs are available with a variety of features that can be customized to fit the needs, design, and budget any project. While many chairs available today look similar or even boast "comparable" specs, it is always recommended to evaluate a sample before making a final decision. What seems to be the same online, or in pictures, can be very different in person. It is recommended to always get a sample of any chair you are considering purchasing. Specs and pictures are not a substitute for evaluating a chair in person. Line up all sample chairs being considered for the committee to evaluate. Frame, Construction, Comfort, and aesthetics are the key points you will need to consider. 1. Quality frames are constructed of 16 gauge steel, are mandrel bent, and ample cross bracing. * 16 gauge steel is the industry standard for high-quality steel frame construction. Frames constructed from 18 gauge steel are thinner and more prone to bend and break with time. * Mandrel bent frames have a sculpted look without wrinkles, associated from crush bending, which creates week points in the frame. * The real key to the strength of any chair is cross bracing within the frame. Over time, even a strong frame that has not been properly reinforced with cross bracing can become weak, creaky, and wobbly, with the potential of a complete failure. The use of abundant cross bracing insures your chairs will withstand the rigors of usage for years to come. 2. Consideration of the manufacturing construction and processes employed will highlight quality chairs. * T-Nut constructions allows for metal to metal contact when screwing seat cushions to a metal frame instead of relying on wood screws, that loosen and often strip out of wood over time. * Upholstery quality is also critical. Fabrics are available in a wide variety of colors, patterns, and abrasion ratings as high as in excess of 250,000 double rubs. You will also want to look for cushions that have sewn seams as opposed to folded or wrapped cushions. * Powder coated frames are scratch and rust resistant. Quality powder coating can be tested by taking a coin and attempting scratch the finish. If this simple test creates scratches, you should consider that the shipping process, stacking, and normal wear will also scratch and chip the frame finish. * Warranties are not all equal. Quality built seating will be warranted against material defect and workmanship issues due to normal use. Manufacturers' warranties range from full lifetime warranties to as short as 5-10 years. A warranty is only valuable if the company is in business to honor it; it is recommended to research a company's Dunn & Bradstreet report to check their financial standing. * Mortis and tenon joints are the strongest type of joint in wood furniture construction. Cheaper low quality wood chairs will cut corners by using wood screws and glue in place of the more specialized manufacturing process of mortis and tenon joints. * Catalyzed (conversion) varnish finishes are not widely available because of the complexity and expense involved. However, they do offer the strongest and hardest finishes, which will provide the most scratch resistance and protection to your wood worship seating. Lacquers and polyurethane varnish finishes are much more common but do not offer the same quality and longevity of catalyzed varnish finishes. 3. Comfort seems as if it should be the easiest consideration when evaluating seating; however, there are many hidden points to consider. Church chairs should all be manufactured with the consideration of comfort and fellowship. Comfort includes addressing proper ergonomic lumbar support, waterfall seat front for optimal circulation, and a relaxed posture so that the body is at rest to receive the message shared in service, instead of constant shifting and distracted while trying to find a comfortable position. Foam may not seem like something that takes much consideration. Some people believe if it is thick it is good. Unfortunately, that is not the case and can be a costly mistake. High density polyurethane foam also known as "true urethane density" foam is most commonly used in high quality seating and is graded by weight. Higher density foams are typically firm feeling by comparison to lower quality foams, initially. A true comfort test is not a 5-20 seconds; everyone involved in the decision-making process should sit in the chairs for at least 15-30 minutes to know how the chair will really feel during services. Because foam is not something seen, many manufacturers will cut cost by utilizing layers of cheaper foams or even carpet padding. Do not be afraid to cut samples open to know what you are really purchasing. Just remember, over time, all foam will soften/deteriorate, but quality foam takes longer and will not break down to the degree cheap foams do, giving you comfortable chairs that will last for decades. 4. Aesthetics may be the easiest point to evaluate. Most reputable chair manufactures can customize worship seating to meet the needs of your project with a myriad of feature options. Available chair features include multiple width options, curved or straight backs, and standard or enclosed backs. Additionally, in certain circumstances adjustments can be made to accommodate for churches with sloped flooring. Additional options include armchairs, kneelers, bookracks and card/pencil/cup holders. The responsibility of good stewardship weighs on the decision-making process of every church project. Churches are finding value in investing in higher quality so that they do not have to replace chairs every 2-5 years. Stackable worship seating allows churches to transition their seating as needed, whether that means adding on as the church grows, or transitioning/repurposing chairs from their sanctuary to fellowship, multipurpose, and educational spaces in the future. It is recommended to research every company you select to work with. Checking a company's Dun & Bradstreet report, which is an independent, expert source of financial data, will give you an indication of their financial stability, and if they will be in business in the future to service any potential warranty claims. In addition, the Better Business Bureau report will help to give you and indication of the quality of customer service and product you will be receiving. Following these basic guidelines will ensure your church will enjoy their new worship seating for years to come!